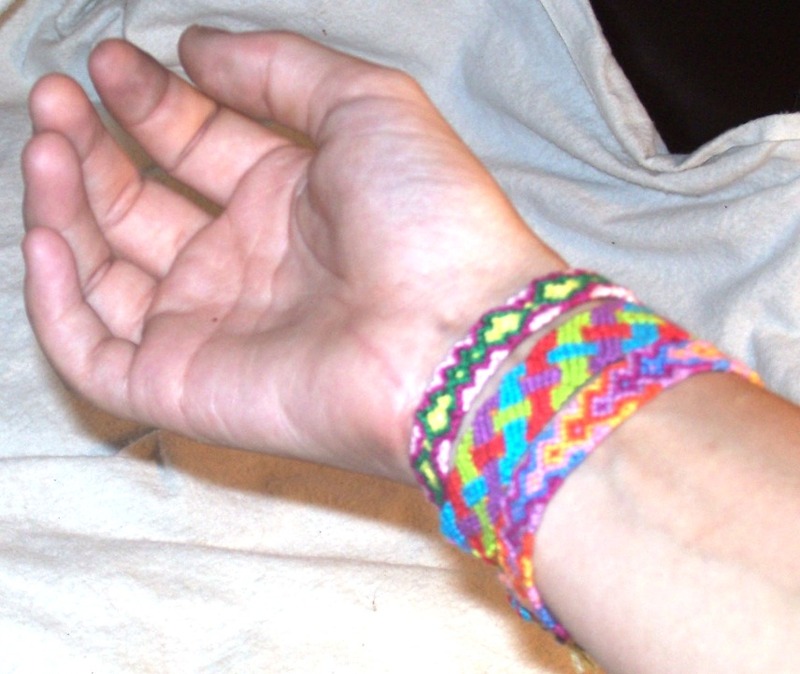 I first learned the Friendship Bracelet Knot technique when I was about 6 or 7, and ever since have been fascinated with the myriad of pattern which can be created. I’m always on the lookout for larger, more complex patterns that transcend the diagonal stripe bracelets of my childhood. Since returning from vacation, I’ve managed to construct several examples. As you can see, the diagonal stripe which the overhanded Friendship Knot creates remains the cornerstone of many designs. The trick to creating complex patterns is manipulating the zig and zag of the striping in order to develop intricate designs. Through this simple method of manipulation, an almost endless array of patterns can be created. 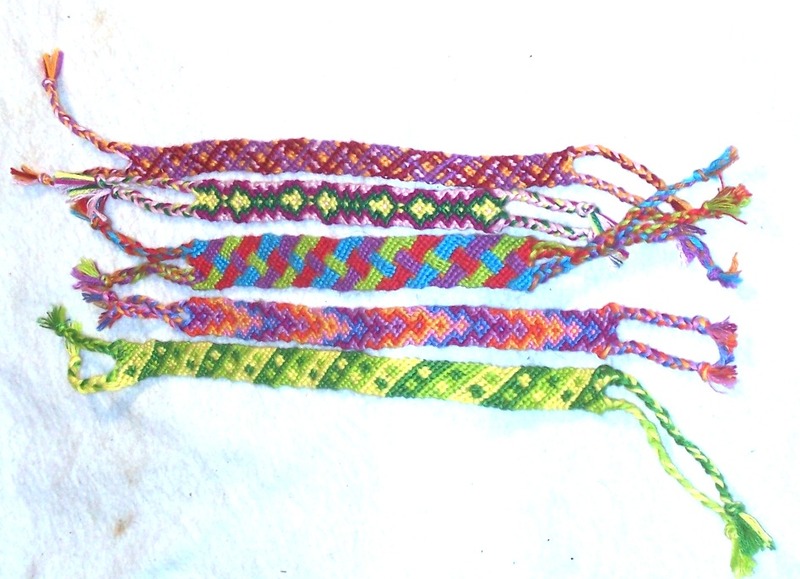 Each of these bracelets can be fastened using a pair of braided cords which adorn either end. By letting the bracelets flow freely from either end, as opposed to ending them in thick knots, the bracelets gain an overall heightened sense of movement and play. These bracelets are basically examples & showcase pieces, bu t will most likely become the models for later products in my Etsy store. And of course, I am always happy to fulfill custom requests, so if one of these bracelets catches your eye, please contact me. Hello i was just wondering if you could make a video tutorial on how to make the braclet in the middle.It is like crossed over braids(the green/purple/blue/red) one! That would be great thank you! Hi! Sorry I didn’t get back to you sooner – it’s been a hectic summer! 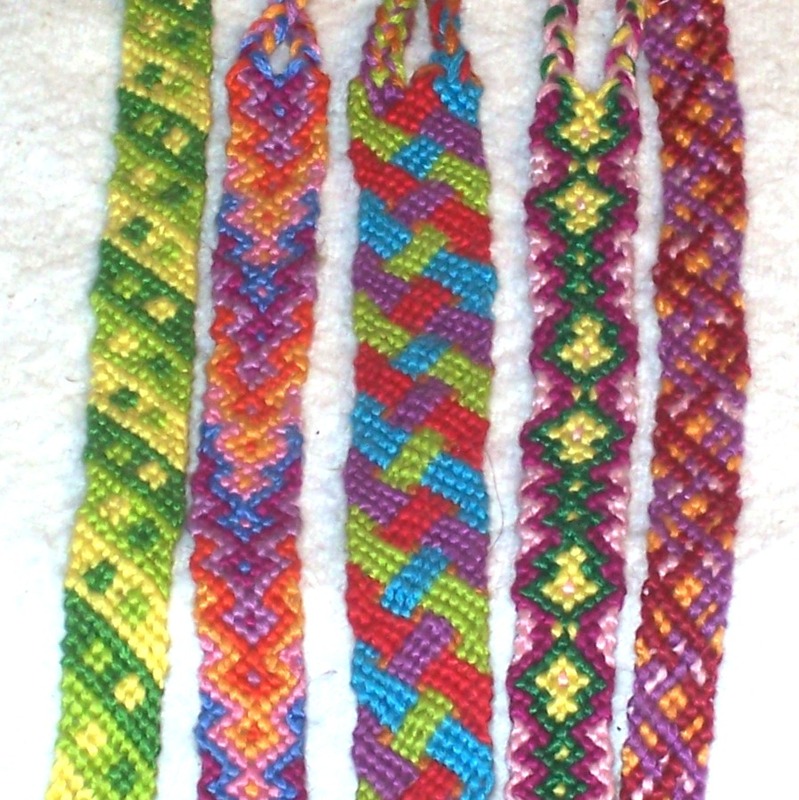 The bracelet in the center was made using 5 different colors (3 strands of each). 4 colors will make up the braid, and the 5th is almost a secret background color. You simply make overhand knots with Color A until you reach the center of the bracelet, then underhand knot the color B over it, and finish the row with the main color. After doing this for each of the 3 strands, you have to make the “turn.” You do this by doing 3 overhand knots with your Color C, an underhand knot with the secret color, 3 underhand knots of Color B, another underhand knot of secret color, 3 overhand knots of Color D, a final secret color knot, and 3 knots of Color A. Then repeat, using colors C & D instead of A & B. After re-reading this, I can see where just describing it could get confusing. If you still have issues with the design, I will surely post a diagram for you – let me know! I do many of the bracelets as I go, but I will try to transcribe a pattern! Thanks!